QUESTION: Mr. Allen, thank you very much for accepting this interview. QUESTION: You have said that victory is not the matter of just one night. What is the timeframe for the war against ISIL? General Allen: President Obama has been very clear on this, as have others: it’s not going to be a short period of time. It’s going to take the cooperation of many of the members of the coalition over a period of time. We’re going to combine our efforts in a number of ways to accomplish the objectives of degrading ISIL and ultimately defeating it. But it is not going to be a short period of time. We have a lot of work to do. The coalition has just begun. The mission is new. And, I’m confident that we will be successful. QUESTION: What are these steps? General Allen: Well, the five lines are: the military line which is obvious. The second is working together as a coalition to stem the flow of foreign fighters; disrupting the finances of Da’esh; conducting humanitarian operations and supporting humanitarian action; and then the fifth is dealing with the image, the de-legitimization of Da’esh as an organization. So, all of those are underway now, and there is significant cooperation. QUESTION: For instance, you have said that planning to free or liberate Mosul could take one year at least. General Allen: Let me be clear about what I said. I said, we anticipated that that would occur within a year. I didn’t want to get specific about dates or times, which is an operational issue. What we’re doing is we’re accomplishing three things simultaneously. Beyond the air strikes, we are conducting training and advising and assisting of the Iraqi security forces that are out in the field today. And some of those forces are in the attack, and we have been supporting those forces in the attack, and we are beginning to see that they are accomplishing local tactical victories over Da’esh and they are beginning to reverse that momentum. The other thing that we’re doing -- and that is beginning to unfold now as the coalition is coming online -- is to create, through building of partner capacity, the local development of Iraqi security forces so that they also join into the counter-offensive. And then the third area in which we will be conducting operations within Iraq is in the improvement of the security sector, security area reform. We will be working closely with the Ministry of the Interior and the Ministry of Defense, ultimately for them to be capable of fielding and sustaining operational forces. So all of those things are occurring simultaneously: training, advising and assisting; building partner capacity; and security sector reform. And they have to occur together. QUESTION: However, the failure in Iraq was very remarkable. Is there any assessment for the reasons of this failure? General Allen: Well, I think there were a variety of things over time. Neglect of the operational requirements of the military forces. Frankly, sectarian policies which replaced key leaders within the Iraqi security forces. And what I think we are seeing now is, what we’re hearing now, is that the Iraqi security forces in the future will be Iraqi security forces who represent all of the people. Very important statements are being made by central government in Baghdad, from Prime Minister Abadi, about an Iraq of the future being an inclusive Iraq. It will include all elements of the society, and that is something that we’re beginning to see already in the conversations that we’re having and the intentions with respect to Iraqi security forces. QUESTION: But still the Sunni clans are very angry from what happened. They feel that they are marginalized in terms of political sharing and economic sharing. How can you tackle this? General Allen: Now you’re talking about the tribes? General Allen: Well the tribes’ voices are important. In the end, Iraq in many respects is a tribal society. And I think that’s a positive aspect of Iraq as a historical entity and as a modern entity. QUESTION: Do you have any specific suggestions in terms of Sunni tribesmen? I know it is very complicated. What tribes are you contacting with? General Allen: We’re talking. I’ll leave that for the Iraqi government to give you the specifics, but I have spoken to a number of the tribes and I know that Prime Minister Abadi has as well. He will continue that dialogue. It is important that the dialogue be between the central government, the Abadi government and the tribes, not between the American government and the tribes. But it is important that we work closely with the Iraqi security forces, that they begin to build their own capacity and begin to work with the tribes with respect to restore stability and security in certain areas of the Anbar Province; for example, in the northwest. So, there is an active dialogue. We all have to remember a couple of things: we are early in the coalition. We are early in the implementation of the plan to roll back Da’esh, to degrade it and to ultimately defeat it. We are also very early in the administration of Prime Minister Abadi. He is saying things that are important. He is doing things that are important. He is reaching out to elements within Iraqi society – all elements of Iraqi society – to include the tribes. QUESTION: Can you be more clear on what tribes you are contacting with? General Allen: I don’t want to get into that. What I don’t want to do is to create a vulnerability that we can’t control here. QUESTION: What role they can do the tribes? General Allen: Well I think it’s a very important role. QUESTION: I know, I know. Is it will be a role like Sahwa in the past? General Allen: That is exactly correct. But beyond the role that they played when I dealt with the tribes in Al Anbar in 2007-08, which was in fact the emergence of the Awakening. There is an intent to bring those tribes into a close relationship with the Iraqi security forces so that together the tribes and the Iraqi security forces can create the security and stability in Al Anbar and other places like it that can benefit all Iraqis citizens. QUESTION: This might lead to internal fighting between the Iraqi tribes… if you just try to attract just some tribes to the Sahwa. QUESTION: Who can guarantee that? 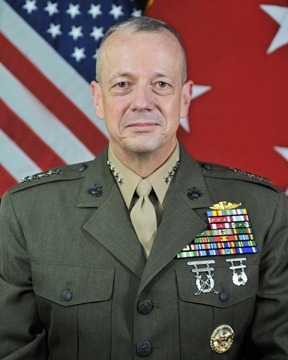 General Allen: The central government. And we will support that. Prime Minister Abadi has been clear about inclusiveness. This is about all Iraqis participating and all tribes. QUESTION: Back to your current tour, one of your objectives is discussing the training of the moderate Syrian fighters. What happened regarding this objective? General Allen: Well, we’re pursuing that objective. In fact there are a variety of things that will be undertaken and we are moving on that now: that is to create three training centers, where elements of Free Syrian Army and moderate Syrian opposition elements will be brought to the training centers. And they’ll be trained and equipped and returned into Syria where they will conduct operations against Da’esh, but will also defend themselves from other elements in Syria, to include the regime. QUESTION: Where? And how many? General Allen: Again, I want to be very careful about numbers and timelines as those are operational considerations but we’ll see three training sites in the region. QUESTION: The mission of the train Syrian fighters is confined for war against ISIL. How can you guarantee that you are not going fight the regime? General Allen: Your question presupposes a limitation that we have not imposed. We are preparing the Free Syrian Forces to fight ISIL, but we fully expect they’ll have to fight Jabhat al Nusra and other elements of the battle space to include the Regime. QUESTION: To include the regime? General Allen: Yes, to include the regime. QUESTION: Do you expect them to fight the regime after they have fought ISIL? General Allen: It is difficult to predict at this particular moment how operations in Syria will unfold. But we clearly expect the Free Syrian forces to be built into a credible battlefield force to hold their own and to deal with Da’esh, but to also deal with Nusra elements and to be able to defend themselves against the regime in those operations. QUESTION: That might create complications for the United States with powers in the region. Like Russia for instance? General Allen: Look, we want the free Syrian elements to be able to defend themselves and to be able to defend citizens associated with a moderate free Syrian Opposition and that is the intent. Building a Free Syrian Army that can be supportive of the moderate Syrian opposition. And as we talk about a political outcome in Syria, which is what we see, a political outcome that does not include Bashar al Assad. The moderate Syrian Opposition becomes not a prominent - not only a prominent - but the preeminent voice in the political outcome, and that comes from political cohesion that we hope to see within the free Syrian – the moderate Syrian opposition. We also hope to see that the capabilities of the Free Syrian Army as they deal with Da’esh, but also as they deal with other elements of the battlespace which will be Jabhat al Nusra and regime elements, that it becomes so capable that in the process of the unfolding political dialogue which will solve the tragedy of the Syrian civil war, that the Free Syrian Army backing up the moderate Syrian political opposition will be the preeminent voice in that process as the situation unfolds. Now there’s going to be fighting in Syria that we cannot necessarily predict. There is going to be a lot of fighting against Da’esh and there will also be, we can anticipate, operations with the Free Syrians defending themselves and controlling their territory and defending their people against Jabhat al Nusra, but also against the regime as well. We have to expect that. QUESTION: How do you see Iran’s role against ISIL? General Allen: You said Iran? Well, as Secretary Kerry said we welcome a constructive role of all states in this process, and to this point we have welcomed a constructive role of Iran. I will leave it at that because that conversation will unfold over time. QUESTION: Any type of coordination with Iran? General Allen: No. We are not coordinating. QUESTION: Final question and I’ll be brief. Why do you refuse the Turkish demand to create a buffer zone and how do you coordinate with Turkey in the war in Syria and in Kobane for instance? General Allen: Well, we are old friends with Turkey. It is a great bilateral relationship that has been cultivated over many years between the United States and Turkey. And they are also NATO ally. Turkey has made important contributions already to the coalition. We’re seeing unfolding today of the positive outcome of conversations between the Peshmerga and the defenders of Kobane and Turkey to provide for the reinforcements of Kobane. And beyond that I simply say that we are in a conversation with Turkey about the role that it can play within the coalition and ultimately dealing with Da’esh. And the details of that conversation we will hold close between the two of us until we have come to an agreement about what that relationship will be within the coalition, and what role Turkey will play within the coalition and at that point we will make it very public. QUESTION: Thank you very much, Mr. Allen.